^Squad is not final yet. Pakistan has said Amir can force his way back in with performances during the England ODI series and our selectors will perhaps include Yasir at the expense of a failing batsman. Selectors should at least give Taskin a go at Ireland. Soumya's place should be up for grab as well if he continues to fail in Ireland. Selectors prematurely announced the team. ICC deadline is April 22, there was no pressing reason to declare the team early. Taskin just took four key wickets against Prime DSC. Tomorrow his team (Rupganj) will have a title decider match against Abahani. Wise thing for the selectors would have been to wait and watch player performances in those vital Super League matches. Rahi's selection seems nonsense for dry-flat wickets that are being expected for this WC. Soumya just made another duck. He is barely getting past single digit scores nowadays. Had he not been an Abahani player, I highly doubt he would have been selected with his current dismissal form. Taskin also went for 54 against Prime DSC. I am super glad that selectors ditched this fool for the wc. Media r shamne ashlei atlemi r naykami chara r kichu korena. Dheklei ekhon tabrate mon chay. Many of our other players have done much worse than crying in front of media. Lets try to judge a player based on his performances, and Rahi simply does not have performances to back his selection in the WC squad (went wicketless in the same match Taskin got four). Taskin also went for 54 against Prime DSC. On a small BKSP ground, economy rate of 6 is quite reasonable. He broke vital partnerships whenever DSC found any momentum. Except for Marshall, his three other wickets (Saif, Shykat, Taibur) were all set batsmen when they got out to him. This match showed his value on a dead wicket where Rahi could do nothing. Honestly speaking, Taskin was always a super expensive bowler. 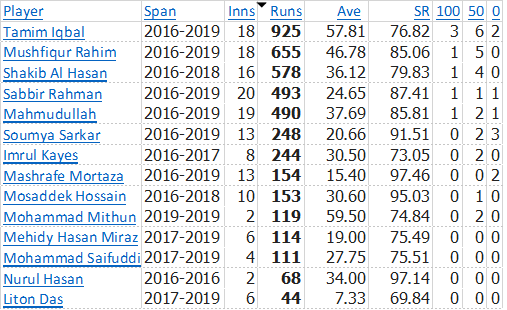 Look at his last five international matches - ODIs and T20Is - and you will conclude that he was rightfully dropped from the international arena. We cannot afford a bowler who comes and releases all pressure. Even on seaming conditions on NZ and South Africa, Taskin was very expensive. Taskin had a good BPL but Shafiul had a decent BPL too. If based on domestic performance Taskin gets picked, why no Shafiul? Shaiful has no pace, and even though Taskin has pace, he is expensive. His recent four wicket haul could be a pumped up performance for getting overlooked for WC. Not buying it. Also in the match where Taskin claimed 4 wickets, he conceded 54 runs out of 205. This again proves that he remains a very expensive bowler. Economy rate matters at LOIs. ^^ On BKSP, teams generally score 300+. DSC merely got past 200, and Taskin played a key role wrapping them up so cheaply. Wickets that Taskin got are recognized names in the domestic, and are key batsmen for DSC. He is not necessarily a pacer for seaming wickets. His value is in unsettling batsmen with variation of line, length, and pace, which many suspect will be vital skills to have on WC batting friendly wickets. With Rubel slowing down considerably, we now have an one-dimensional medium pace attack, where Saifuddin is prolly the fastest. People that are calling for Taskin are not doing so because he cried, but because how he could add some variety to our pace attack. In BPL 2019, Taskin's name is missing from bowlers with best econ rate. In his own team Sylhet Sixers, Taskin was more expensive that Alok Kapali. Only Alamin had worse econ rate, but Alamin played only five matches. In the two matches Taskin played so far in DPL, he was the most expensive in his team. Personally for me, if you don't have the numbers to show for, I won't buy it. Simple. Taskin is not Brett Lee or Shoaib Akhter to unsettle batsmen with pace and bounce. That is just a myth. Plus in terms of pace, he is just above average by Bangladesh standard. Also unsettling only works if you can keep it tight. Even bowlers with serious pace like Mohammed Asif, Wahab Riaz, or Mitchell Johnson used to release pressure with flurry of boundaries instead of unsettling batsmen. Therefore, if you overlook numbers, you are likely to get buyer's remorse. Taskin is expensive but he takes wickets which is important. He needs to work on his economy rate. Abu Jayed is a good choice b/c he can swing the ball and he bowls like James Anderson from England. Only bad selection is Soumya and Liton. Soumya scored 0 runs today and he has no fifty or century in 11 matches in dpl but the coach is keeping faith in him. if you overlook numbers, you are likely to get buyer's remorse. If you just look at raw numbers, without watching matches or doing any analysis, obviously you will not realize that Taskin comes to bowl when opposition batsmen are set, or when they're getting ready to slog the heck out of your bowlers. Obviously his econ will be higher than others. Fizz is yet to replicate his success at home outside. Less said about Saifuddin's SR is better. Cricket is a team sport. Taskin looks for wickets. Mash and Fizz keep the run rates low. We don't have any genuine wicket takers in our bowling lineup. Taskin would have added real value. If the ball does not grip on the surface, Mash or Fizz are less likely to get wickets. That's when you need someone like Taskin, with a different skillset, to give you breakthroughs. Tashkin would have been trashed all over the place in the batting friendly WC pitches, Not saying our other bowlers wont be trashed, but in this WC if you are not something special like rashid khan or rabada i dont see bowling winning the game at all. Taskin would do well in flat tracks when he cant even maintain good eco in slow or bowling friendly pitches? Last edited by ahnaf; April 20, 2019 at 10:01 PM.. Even bowlers with serious pace like Mohammed Asif, Wahab Riaz, or Mitchell Johnson used to release pressure with flurry of boundaries instead of unsettling batsmen. Mohammed Asif was just a medium pacer getting good amount of swing and hitting good line and length. If its Mohammed Amir then yes you are correct. Not sure if I am missing something, but Mash, Shak, Rubel also have strike rate in the 30s. Only Fiz has SR in the 20s. Taskin has lowest SR, but Mash, Shak, and Rubel spend only a few more deliveries to get a wicket compared to Taskin. But among all of them, Taskin has the highest econ rate. But it can be argued that since Taskin has a slightly better strike rate, he also has to spend a little more runs for each wicket he earns, and thus higher econ rate. Strictly stat wise, all the above bowlers are same more or less. But whenever I think of Taskin, the images that comes to my mind are three (1) short ball (2) getting hammered for boundaries more often than not (3) baby face. Thus no Taskin in my team. Correct. I intended to write Mohammad Sami (of PAK) - serious pace but very expensive bowler. What is the value of those two wickets? Here is the BD batsmen performance against all teams since the last World Cup. I don't see any logic to drop Imrul. Imrul should have been included. His performance is also better than Soumya and Liton outside Asia during the same period. Bottom line is, Taskin got wickets. Doesn't matter when or how he got those. He is again proving how much we are gonna miss him. Plus he is now a capable batsman. Almost an all-rounder. Anyway, i am super glad we didn't picked him. If it was upto me i would have picked Yasir Ali instead of Rahi. It was really unnecessary for us to pick a 4th pacer. The initial plan was to start the WC prep camp from Monday. However, now that Abahani has a good chance to win the title, they're reluctant to release their players (who are majority of the WC squad). Rhodes wants players to take at least two days rest after DPL, which ends on April 23. Taskin didn't do anything significant there, but he did not look as useless as the three medium-fasts who had SR of 90, 102, and 174! Besides him, and besides a surprise spell from Mosaddek, we simply didn't have a wicket taker in that tournament!